When the snow starts falling, there are many ways to enjoy the winter in Reno Tahoe. The region offers up many surprising adventures and experiences for locals and visitors. Here are some of our favorites to explore. Photo provided by Ben Arnst/Squaw Valley Alpine Meadows. Squaw Valley Alpine Meadows is lighting up its family fun zone, SnoVentures with a new way to enjoy winter in Reno Tahoe. 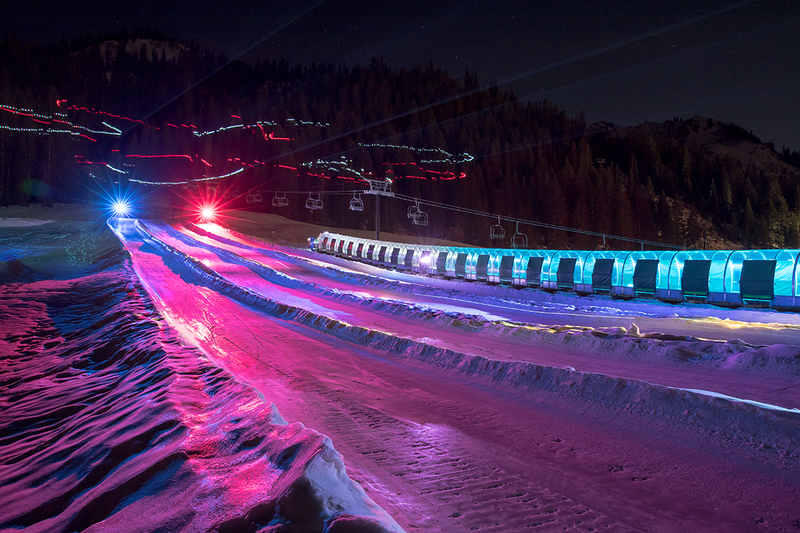 Disco tubing features colorful LED lights, lasers, and live DJs from 5-8 p.m. most weekends through March 23. 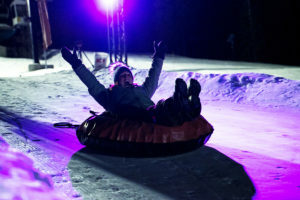 Participants spin down the tubing lanes to music and lights. Snow tubing sessions are 55 minutes long and begin on the top of the hour. DJs include All Good Funk Alliance, Dusty & Garren, and DJ Izzy. For more information and to buy tickets, visit: squawalpine.com/events-things-do/disco-tubing. See how the creative culinary team at Northstar California puts a spin on the traditional S’more with different s’more stations. 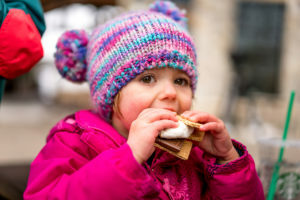 At 4 p.m. on Feb. 23, come to the Village Overlook to celebrate Northstar’s sweetest tradition, S’mores. For more information, visit northstarcalifornia.com/explore-the-resort/activities-and-events. Photo provided by Diamond Peak Ski Resort. 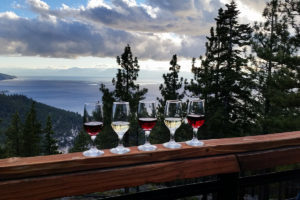 Enjoy one of Lake Tahoe’s most unique on-mountain events this winter with Diamond Peak’s Last Tracks wine and beer tasting events. Held most Saturday afternoons from February through the end of the ski season, Last Tracks participants can advantage of a late-day lift ticket valid from 2 to 4 p.m. followed by a final chair ride up to Snowflake Lodge. There, they can experience breathtaking views and wine or craft beer tastings paired with delicious appetizers. When the event is over, participants enjoy one final run down a freshly groomed trail. For more information and to buy tickets, visit: diamondpeak.com/tickets-specials/specials/last-tracks-wine-beer-tasting. Join Sierra Adventures on an adventure and dogsled through the high Sierra winter wonderland. Your dog sledding adventure begins with a morning pickup at any local hotel in the company’s complimentary shuttle. After a scenic drive, Sierra Adventures will drop you at the staging area for pictures and petting the dogs. For more information, visit wildsierra.com/dogsledding.htm. 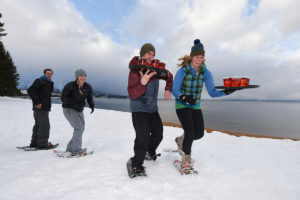 Think you have what it takes to run with a full cocktail tray in hand through obstacles up and down the beach at The Beacon Bar & Grill while wearing snowshoes? Even if you don’t, bring your friends and family to watch the lively event at Camp Richardson’s Snowshoe Cocktail Races! Prizes are for the fastest and cleanest at the obstacle course finish line. Observers can enjoy food and drink specials. For more information, visit camprichardson.com. At Dickson Realty, our team of local experts knows the best ways to enjoy winter in Reno Tahoe. To learn more about the Reno/Sparks region, contact one of our Realtors today.